Had this been made in the previous “B” years, this Jaws-on-Steroids epic would have featured fake sharks and lots of quick editing to compensate for the lack of a credible monster. 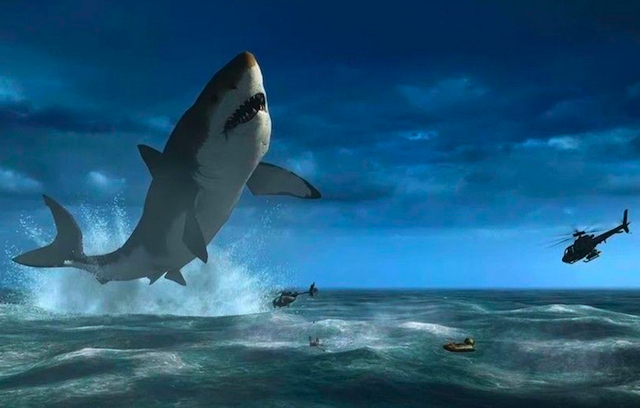 Now money is thrown at computer generation, and The Meg (short for the prehistoric giant shark, the Megalodon) comes to life in vivid 3D or at the IMAX. The absurd characters and the stiff acting remains, however, and this co-production between the U.S. and China features both cultures of performers reciting lines as if they just memorized them. But the movie has that level of action and kitsch that makes it work, even though the size of the shark seems to fluctuate between scenes, and at some point might be too big to fit in the ocean. The film begins with Jonas Taylor (Jason Statham), an oceanographer, attempting to rescue a deep water explorer sub. He doesn’t get everybody out, and is convinced that a giant creature was the cause. His obsessions are ignored, and he drops out of the program. Five years later, an underwater research facility – financed by billionaire Jack Morris (Rainn Wilson) – encounters a monster-like force once again, and the crew decides that only Jonas can rescue them. The rescue is successful, but again leaves one of their own to die. Another facility oceanographer, Suyin Zhang (Li Bingbing), witnesses the huge shark after helping with the rescue. 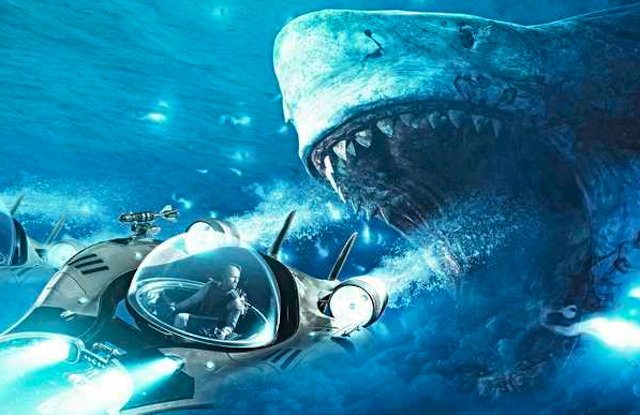 And when “The Meg” attacks the facility, the rest of the story involves trying to capture the elusive giant, as the creature seemingly knows every move the desperate crew is making. When the big fish swims to the Shanghai coast, the pursuit is about to involve innocent beach-goers. The story actually started as a novel, which Hollywood had being trying to adapt since 1996. If they are picking up elements of that book, then the original author might want to pay the screenwriter of “Jaws” some sort of compensation. The pattern of the film… initial skepticism, the proof of existence, getting the wrong fish, the inevitability of another attack on the beach… was all in the original classic. The twist is the high tech ocean facility as rescuers, and apparently Dwayne Johnson wasn’t available to portray the heroic ocean expert, so old reliable Jason Statham stepped in. Statham is a fascinating star, especially in his British-man-of-action mode. In “The Meg,” he repeats his basic angry-but-determined line reading. The film gave him a love interest, the Chinese actress Li Bingbing, but their lack of chemistry is laughable, it seemed that Statham would rather encounter the shark than a romance. And at age 51, he’s not above a shirtless scene, but even that doesn’t generate much heat. Statham and Bingbing come off more like brother and sister than potential lovers, but that ain’t the main story anyway. It’s the massive computer generated shark that is the star, brought up to surface waters through a deepwater portal. In proportion to other sizes, the production couldn’t decide on the relative size of the beast… I wouldn’t had been surprised to see The Meg climb the Empire State building. Once it does absurd things like eat a whale, it ceases to be scary. Steven Spielberg did it first – and better than anyone – by teasing the existence of the shark, and then using its few appearances as the ultimate scare. This is a summer popcorn movie and an air conditioned diversion… the bigness and the spectacle always counterbalances the dry acting (even Rainn Wilson from “The Office” was strangely in the background). In “B” movies, it’s the creature that audiences want to see, and human performers are there to either capture it or get eaten. Which, interestingly enough, is a appropriate metaphor for life.